There aren’t a lot of comics that you *need* to read. There are a lot of comics that you *want* to read, and love to read, but most of those comics ultimately have no genuine impact on your life other than giving you something to talk about with your comic reading friends who (surprise, surprise) also already loved them. Most of the time you’ll forget those comics within days of having read them. 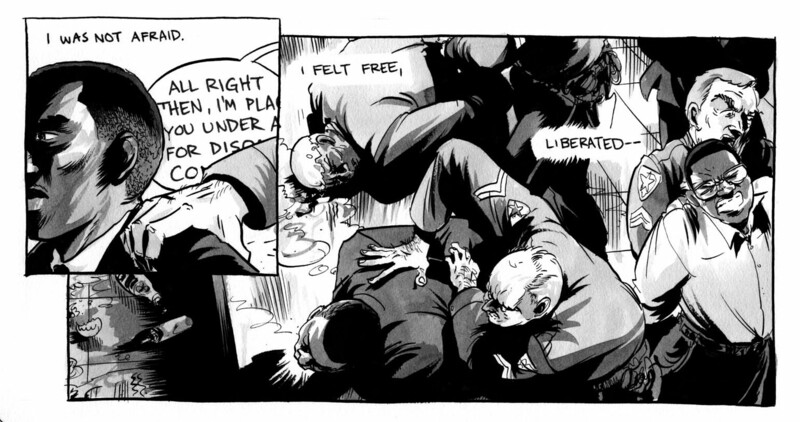 Rarely does a comic, or graphic novel, come along that you *need*, I mean really, for the sake of your own social and cultural betterment, NEED to read. The ones you need to read are the ones that have a lasting impact beyond briefly being mentioned in those comic Facebook groups you’re in. MARCH is one of those “need” books. In fact, and this is quite a big claim, it might be the most “need” comic/graphic novel of all-time. 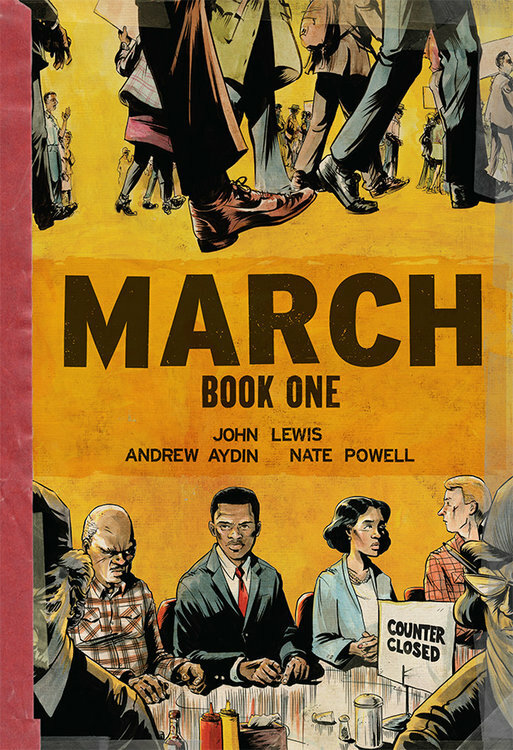 The first entry in a trilogy of graphic novels, MARCH: Book One tells the life-story of Congressman John Lewis, with a focus on his childhood and his journey to becoming a leading fighter on the front lines of the civil rights movement. The story unfolds as Rep. Lewis is telling two kids from his district about how he got to where he is, and the setting is Jan. 20th, 2009, the day President Obama was inaugurated. 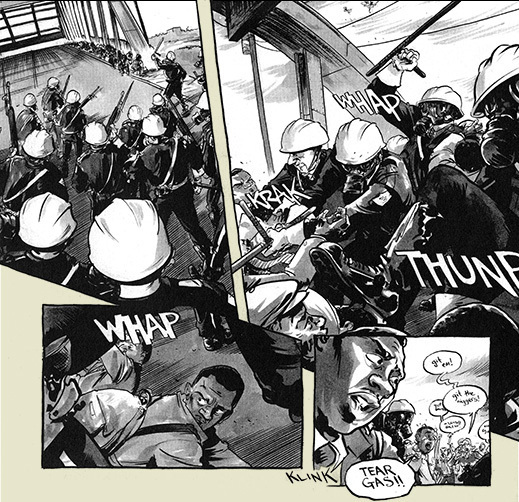 The opening of the book is a depiction of the Selma-to-Montgomery march, where Lewis walked side-by-side with Dr. Martin Luther King Jr., as well as about 600 other marchers, in a peaceful protest, but they were blocked by state troopers and consequently attacked and beaten. It’s important that the narrative begin here because this was an pinnacle moment in Rep. Lewis’ life, and in the civil rights movement overall. The incident in Selma was broadcast all over television and shed a national light on the type of inhumane cruelty the black community had been suffering. Rep. Lewis lead a fascinating life. MARCH shows us what he was like as a young man, in his own words, and how even as a young boy he had a deep, intuitive understanding of the how precious life is, and how mistreating it can’t be justified. Also, as someone who resides in a suburb of Nashville, it was bittersweet for me to see how our city is so closely tied to the fight for civil rights. Much of this volume of the story focuses on the peaceful sit-ins that Lewis helped organize at diners right here in the Tennessee capitol. I honestly had no idea that ever happened just outside my own backyard, and I, admittedly, felt a little shame that it wasn’t taught to me when I was in school, and that I hadn’t taken the time on my own to learn about it. Luckily for us, we have movies like Selma and The Butler to help us understand what life was like for the people paving the way for civil rights, and what life was like during that era, but there’s only so much a 2 hour movie can show you, and then on top of that they’re being told by artists. MARCH is an opportunity for you to see and hear what was going on through the eyes and words of a man who was actually there, fighting at the forefront of the movement. Sometimes it’s hard to witness, to see what they were enduring, but it is a historical part of this great country of ours, and one we need to be reminded of. Recently, the trilogy set of MARCH has begun to sell out, so tracking down a physical copy of that might be tough, but it looks you can get a copy of Book One, as well as Book Two & Book Three (the first comic to win a National Book Award), through Amazon, and I’m sure places like Barnes & Noble or Books-a-Million might have them as well. You can also check with your local comic shop to see if they have any in stock. If you can’t get a physical copy, all three are available in Amazon’s Kindle format, and through Comixology. I want to strongly recommend that you get this and read it, and I even urge you to consider getting it for any kid in your life (son, daughter, niece, nephew, cousin, etc.) from middle-school-age on. I believe it could teach them a lot about a time period in the U.S. that they may struggle to comprehend otherwise. In addition to the crucial historical information, Rep. Lewis’ life is immensely inspiring, from his wise maturity at a young age through his firm resolve to fight for desegregation. At 76 years old he continues to be a man of strong determination and action. His story will open your eyes and give you hope. Get a hold of MARCH, by any means necessary, and let it move you, but more than that… let it motivate you.